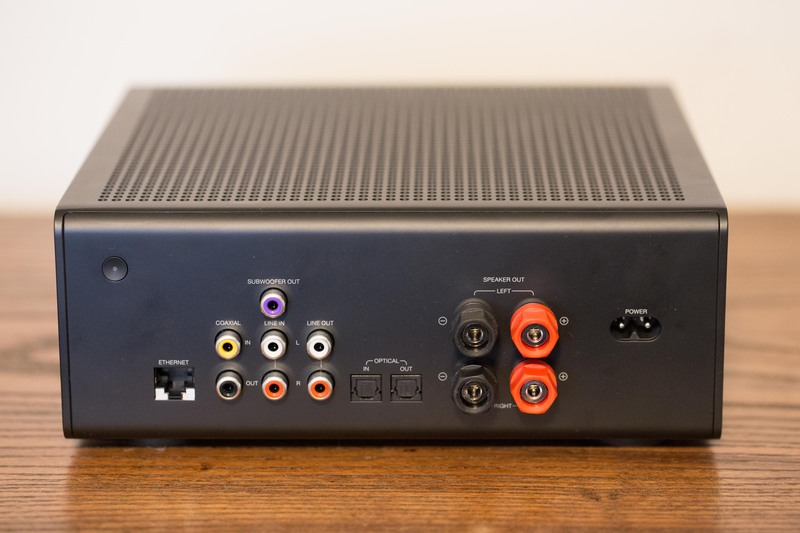 The Echo Link Amp is designed to give Echo owners options. Instead of settling for the sound from a couple of Echo speakers, this amp lets owners use a set of nice bookshelf speakers. Best yet, this replaces a large receiver generally needed to power speakers. At $299, the Echo Link Amp lives in a curious spot. It’s less expensive and smaller than a traditional home audio system. Yet it’s more expensive than smaller desktop amps with a similar power rating. Like its little brother, the $199 Echo Link, the $299 Echo Link Amp requires another Echo device. The Link and the Link Amp lack a microphone, which is needed to talk to the system. These two products are, if you will, the missing link between Alexa and better sound. There are less expensive ways to replicate a lot of the Echo Link Amp’s feature set. There are a handful of small and powerful amps available for around $50 that can take audio from an Echo Dot and power a set of speakers. I use a $30 Lepai amp to power a set of Yamaha outdoor speakers on my deck. I used this system to test the Echo Link Amp. It’s finally nice outside here in Michigan. The sun is out and the leaves are budding. I’m writing this from my deck where I have two Yamaha speakers connected to a small amp and an Echo Dot, which are mounted to the floorboards. It’s the best. I can yell requests to the Dot from my fire pit. The Dot and $30 amp have survived two Michigan winters, too. This is the perfect use case for the Echo Link Amp, though I’m sure Amazon will disapprove of the placement outside. That’s okay. Like when I tested the Echo Link, I enlisted the help of another Echo product to make switching between the audio sources a bit easier. Using an AV switcher I was able to connect everything simultaneously and press a button to switch between the sources. I cued up some summer BBQ music and stepped back, remote in hand. The $30 amp had the same bass response, vocal reproduction and soundstage as the $300 Echo Link Amp. On paper, the Echo Link Amp has more power, but in practice, that power did not result in a difference with these outdoor speakers. I disconnected everything and plugged the speakers directly into the amps. Nothing changed. Hank Jr. sounded the same. For better or worse, of course. I tried the system on a set of old Infinity speakers and had the same results. The sound had the same fidelity. On both systems the highs were just as high and the lows were just as low. The quality had the same, admittedly, lack of punch, but sounded good enough to blast Kenny Chesney throughout my yard. The $299 Echo Link Amp shares a lot with the $199 Echo Link. The main difference, as the name suggests, is the amp. The Link Amp has the ability to drive a set of speakers, whereas the Link needs to be connected to an amplifier. I found the Echo Link to be a fantastic addition to a home audio setup. The $199 device provides a digital connection lacking on other Echo devices and I found it to improve the audio quality of streaming services. The Echo Link Amp, however, is a touch disappointing, but at the same time very proficient at its job. Buyers are paying for the ease of use more than the quality of the amplifier. It’s clever too. If the connected Echo Dot is asked a question, it responds with the answer. This lets the owner turn off the amplifier and still retain access to Alexa. Only when the owner asks the Echo to play audio does it offload the task to the powered speakers. With a series of inputs, the Echo Link Amp can easily serve several roles, including as a 2.1 channel home theater receiver. The Echo Link Amp is a lovely device even though I find the audio quality lacking when compared to less expensive amps. It’s clever and I’m surprised Amazon is selling the device. While the rest of the Echo product line is a mass market play, the Echo Link and Echo Link Amp are designed for a smaller market. The Echo Link Amp features a set of functions unavailable on any other Echo device and the easiest way to add Alexa to a set of speakers.